It's also nice to look back at my previous words I've chosen over the years. I admit I've never been good with New Year's Resolutions so I began choosing a single word to guide me for the new year instead. A single word that will sum up the essence and focus for the next 365 days of my life. Dresden trim, washi tape and stencils...my oh my! I like to do an art journal page on my WOTY. It helps me to keep seeing my word. How do you display your word? Or do you? Don't box yourself into only choosing one word if multiple words or a phrase resonates with you. There is no word limit on this, so choose something that resonates with you! Write journal your word down! I love all the shimmer! Don't box yourself into only choosing one word if multiple words or a phrase resonate with you. There is no word limit on this portion, so choose something that resonates with you! Do you choose a WOTY? I would love to hear what yours is if you do. In December, Gwen's Artist Tribe is focusing on creative ways to use Dresden Trim and English/German Scrap. 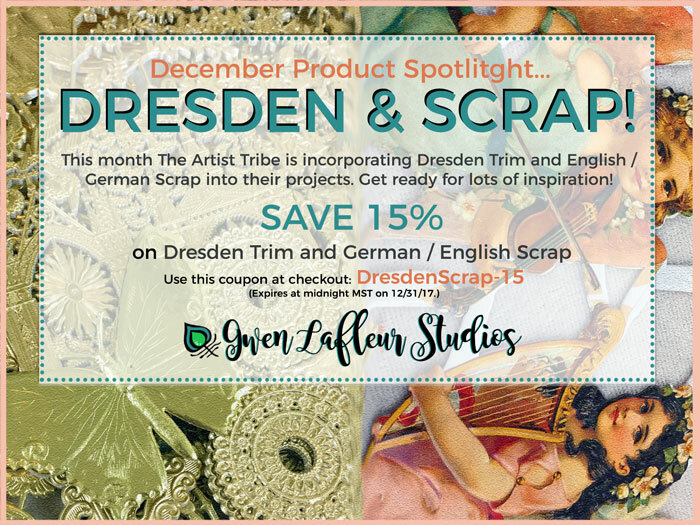 You can save 15% when you order any Dresden or Scrap during December. Details are on the coupon below. I fell in love with the Children with Signs (Vintage Vibe - German & English Scrap) because I have these small sentiment stamps from Rubbermoon which I immediately envisioned using with the pieces. Embossed foil paper trims, also known as Victorian Scrap or recently as "Dresdens"
They are made of embossed, die-cut metallic foil paper. These old-fashion styled Dresden trims are sooooooooo cool to work with. They have a fabulous metal look to them but in reality are easily bendable and mold around corners like butter! And I am still crushing on this silk from Darn Good Yarn, love the colors, love the little frayed bits and bobs and especially love the feel of silk! I also adore the bronze Hamsa charm to the paint brush handle. According to Aristotle, the hand is the "tool of tools" so I figured it would be a perfect addition to the paint brush. I popped her up with some glue dots and added a small old and broken paint brush and then painted doodles along the edges. It was easy to cut the background paper after stamping to fit the inside of the box and then glue a word bead along with a teeny tiny butterfly from the collage sheet just for fun. Adding my painted box to the Paint Party Friday link up!